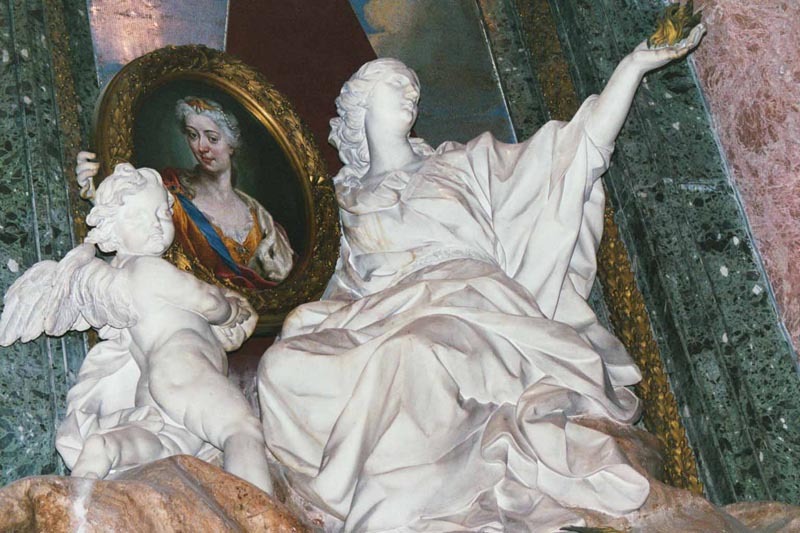 This masterpiece by Canova commemorates James III, the 'Old Pretender' to the English throne, and his two sons, Bonnie Prince Charlie and Henry. Antonio Canova, the leading Neo-Classical sculptor of his time, used this location to mark the spot in the grottoes below where the three last members of the royal House of Stuart lie buried. Facing it is the Stuart Monument, designed in 1817 by A. Canova, in imitation of a truncated pyramid-shaped funeral stone and executed in marble only in 1829. In its simple linearity it is the most appropriate and penetrating funeral monument in the Basilica. In it, in fact, Canova's Christian spirit was able to instill a vitalising lyricism into his pagan neoclassic inspiration. The soft effect of the patina confers a harmonious unity to the various elements of the composition, from the three busts of the Stuarts to the delicate spirits who, with their upturned faces, flank the closed door of the tomb, symbolizing serene Christian resignation to death. The Monument was erected at the expense of George III, king of England, triumphant over two other rival pretenders to the throne, and who was in exile in Rome. Opposite, toward the central nave is the impressive Monument to the Stuarts, a masterpiece by Antonio Canova (1757-1822), who completed it in 1819, commissioned by the British Government. It celebrates James III (1688-1766), Pretender to the Kingdom of England, the husband of Maria Clementina Sobieska, and their two sons, Charles (1720-1788) the Duke, and Henry (1725-1807), Cardinal of York and Bishop of Frascati, Ostia and Velletri. All three died in Rome, where they had been exiled. In the center of the white marble stele an inscription recalls these last three members of the Stuart family. On it are portrait busts of them in profile. Above, is the escutcheon of the Stuarts with two lions rampant. Below, next to a closed door, are two of the loveliest sorrowful angels, their wings folded and their heads inclined over two upside-down torches which they are about to extinguish. Above the door a biblical sentence encourages Christian hope: "Blessed are those who die in the Lord". George III of England covered the expenses of this monument, begun in 1817 and completed in 1821. This is a stupendous work by the young Antonio Canova; It may seem to be a pagan monument as it recalls the funeral steles of ancient Greece. However, it is a Christian monument to the last three members of the royal house of Stuart who, because they remained faithful to the Catholic church were removed from the throne of England. The monument is dedicated to James III (1688-1766) son of James II (1633-1701) the last Stuart to reign over England, Scotland and Ireland, and to his sons Charles Edward (1720-1788) and Henry (1725-1805). Henry, Cardinal Duke of York was the bishop of Frascati (1761) and of Ostia and Velletri as well as archpriest of the Vatican Basilica and Deacon of the Sacred College. After the death of his brother Charles, he took the name of Henry IX and proclaimed himself King of England. The monument is in line with the underlying tomb in the Vatican Grottoes. The small fronton on top is embellished with a carving of the Stuart coat of arms of two lions rampant. On the lower part, in front of a closed door, symbol of the old unfortunate dynasty stand two angels whose incomparable beauty blends with their pain. The folded wings and bowed heads express resigned sadness over the mystery of death. All this sadness, however, is dissipated by the comforting words of the bible over the closed door "Happy are those who fall asleep in the Lord". George III, king of England (1738-1820) wanted to forget all monarchical and dynastic rivalry, so he generously financed the cost of this monument. This monument by Canova was commissioned by the British government. King George III covered the expenses of this monument, completed in 1821. It commemorates James III and his two sons, Charles and Henry. James II was the last Catholic to rule England, and fell from power in the so-called "Glorious Revolution" of 1688. He died in 1701. His son, James III, was known as the "Old Pretender" to the throne of England and spent most of his life abroad. Though he was recognized as the King of England by Spain, France, and the Papacy, he died in Rome in 1766. When his eldest son, Charles Edward the Duke, died in 1788, the succession of the Stuart line fell to the last male heir. Henry assumed the title Henry IX (ironically, the title following Henry VIII who split England from Catholicism to begin with!) but he was never recognized as King of England, even by the Papacy. Nevertheless he is known in history as the "Young Pretender." He died in 1807 as the Cardinal of York and Archpriest of Vatican Basilica. Two exquisite, sorrowful angels flank the monument, wings folded and heads inclined over two upside-down torches which they are about to extinguish. 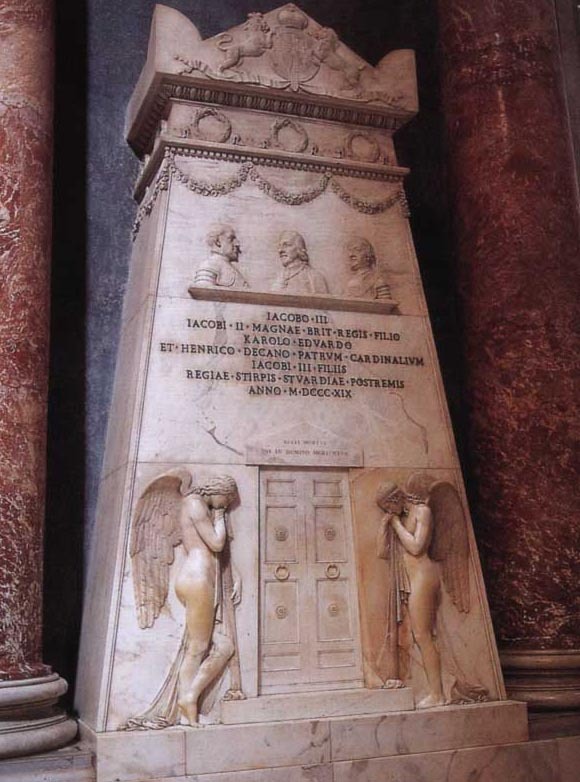 When King James died in 1766 and was buried in the crypt of the basilica, Pietro Bracci was engaged to design a monument to James' memory.1 Nothing further, however, came of the project. 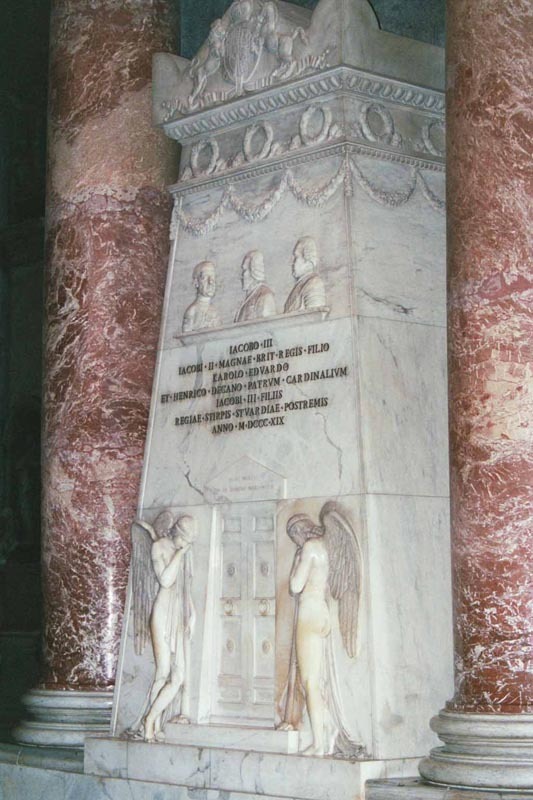 In 1810 Monsignor Angelo Cesarini, executor of the estate of King Henry commissioned Antonio Canova to design a monument to Henry's memory.2 A price of 9,000 Roman scudi was agreed upon, but it seems that not all of this was paid. Canova prepared a first design for the monument which is now in the Biblioteca Nazionale di Firenze (the National Library of Florence). A second design is in the Museo Civico di Bassano.3 The project for the monument, however, then languished. With the financial backing for the project now certain, a change was made to include James III and VIII and Charles III in the monument as well. Canova prepared a third design for which there is a terracotta model in the Gipsoteca di Possagno. The fact that the monument was originally intended chiefly to honour Henry IX and I is shown by the central position that his portrait has in the final work. In 1819 the completed monument was installed in the basilica. 1 "Magick Land", Apollo 99 (June 1974), 407. A pen and ink drawing of the project is owned by the Art Institute of Chicago. Pietro Bracci was born in Rome in 1700, and died in the same city in 1773. 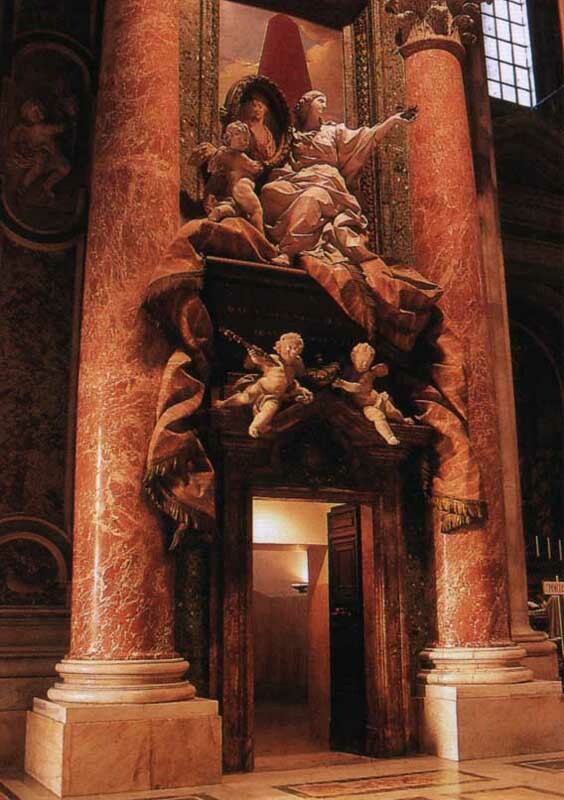 He sculpted the figures in the Monument to Queen Clementina in St. Peter's Basilica. 2 Antonio Canova was born in Possagno, near Treviso, in 1757, and died in Venice in 1822. He was the foremost sculptor of his time. Queen Louise commissioned him to sculpt the monument to Count Vittorio Alfieri in the Basilica di Santa Croce in Florence. 3 Maria Sofia Lilli, Aspetti dell'Arte Neoclassica: Sculture nelle Chiese Romane, 1780-1845 (Istituto Nazionale di Studie Romani, 1991), 63. 4 Ibid. 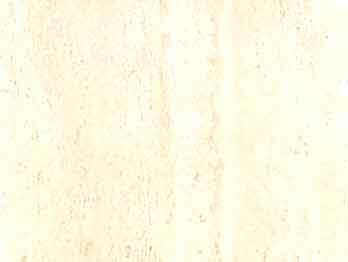 50,000 francs is the equivalent of the original agreed price of 9,000 scudi (or about £2000). Another source suggests that the payment was only 5,000 francs, but this must be a typographic error. Ceyrep, "Dates of Births and Deaths of the Pretenders", Notes and Queries IX (February 25, 1854), 177, says that the Hereditary Prince of Hanover "sent a donation of fifty pounds for the purpose to Pius VII", but this seems to be a misunderstanding of the figure of 50,000 francs. The monument was commissioned by Pope Pius VII in 1817 and erected in 1819. The Hereditary Prince of Hannover (who called himself "Prince Regent" and later "George IV") made a gift of £50 towards the cost of the monument. It is from this circumstance that has developed the erroneous belief that the Hereditary Prince of Hannover raised this memorial at his sole expense (cf. Notes and Queries, volume 9, February 25, 1854, page 177). In 1766 the body of King James III and VIII was laid to rest in the crypt. In 1807 the body of King Henry IX and I was laid on one side of it, while the body of King Charles III was brought from Frascati to lie on the other side. Three separate tombstones were erected on the site. In 1938 the bodies were moved to a new location in the left aisle of the crypt between the tombs of Pope Innocent XIII and Cardinal Merry del Val. The three tombstones were given to the Pontifical Scots College. 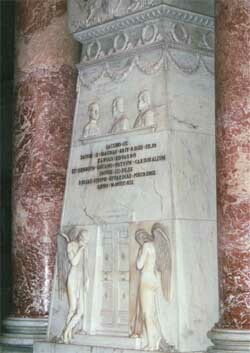 In 1939 a travertine sarcophagus surmounted by an iron crown was erected over the three bodies; the sarcophagus bears an inscription identical to that on the Stuart Monument in the basilica above.